The 2nd Annual Steel City Jazz Festival features ten shows and nearly twenty groups packed into the span of four days. 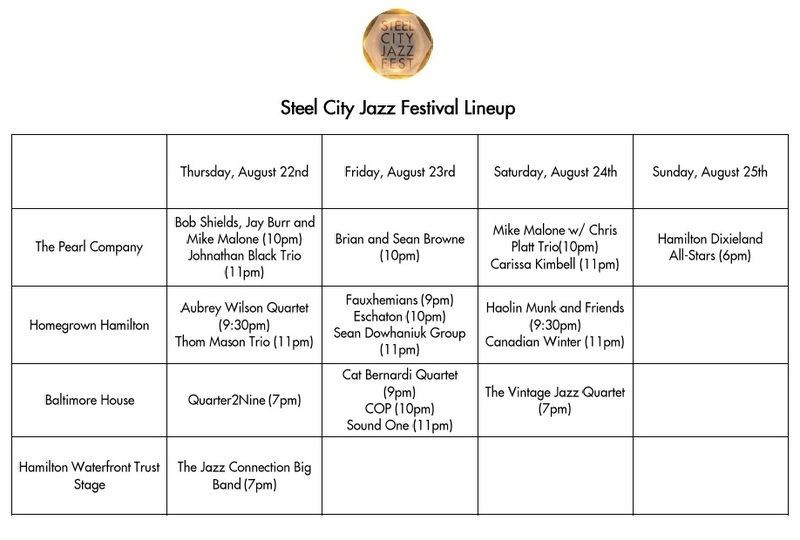 The 2013 Steel City Jazz Festival will take place from August 22nd to August 25th, 2013. We are very pleased to be partnering with three fantastic live music venues this year: Homegrown Hamilton, The Baltimore House and The Pearl Company, as well as the Hamilton Waterfront Trust Stage for our opening show. The Steel City Jazz Festival was founded by Chris Ferguson and Emily Milko after returning from a trip to the 2012 Detroit Jazz Festival. Maybe it was the result of riding high after seeing both Wayne Shorter and Sonny Rollins perform in one weekend, but Chris and Emily decided to give throwing a jazz festival a try. And so preparations began and in September, 2012 the Steel City Jazz Festival was born. Featured artists include Aubrey Wilson Quartet, Brian Browne, Canadian Winter, Carissa Kimbell, Cat Bernardi Quartet, COP, Eschaton, Haolin Munk, Jazz Connection Big Band, Mike Malone with the Chris Platt Trio, Sean Dowhaniuk Group, Sound One, Thom Mason Trio and many more. For more details about the artists check out this LINK. The International Village presents the music of Room for Two from 12 to 2 PM as part of their annual 'Music in the Village' festival. Join the International Village BIA this summer with the 3rd season of the popular festival that takes place at Ferguson Station. Each week will also feature one food truck to Ferguson Station as part of the fest so tune in to twitter @HamIntlVillage to see who is serving at Music in the Village and when. For more information about ‘Music in the Village’ contact Susie Braithwaite at the International Village BIA at info@hamiltoninternationalvillage.ca and check out www.hamiltoninternationalvillage.ca. This year's festival will be an exciting line-up featuring a host of many different genres of music and Hamilton talent. Check out www.hamiltoninternationalvillage.ca for details. The International Village presents the music of Getting Strange from 12 to 2 PM as part of their annual 'Music in the Village' festival. Join the International Village BIA this summer with the 3rd season of the popular festival that takes place at Ferguson Station. Each week will also feature one food truck to Ferguson Station as part of the fest so tune in to twitter @HamIntlVillage to see who is serving at Music in the Village and when. For more information about ‘Music in the Village’ contact Susie Braithwaite at the International Village BIA at info@hamiltoninternationalvillage.ca and check out www.hamiltoninternationalvillage.ca. The International Village presents the music of Tomi Swick from 12 to 2 PM as part of their annual 'Music in the Village' festival. Join the International Village BIA this summer with the 3rd season of the popular festival that takes place at Ferguson Station. Each week will also feature one food truck to Ferguson Station as part of the fest so tune in to twitter @HamIntlVillage to see who is serving at Music in the Village and when. For more information about ‘Music in the Village’ contact Susie Braithwaite at the International Village BIA at info@hamiltoninternationalvillage.ca and check out www.hamiltoninternationalvillage.ca. The International Village presents the music of The Boys from 12 to 2 PM as part of their annual 'Music in the Village' festival. Join the International Village BIA this summer with the 3rd season of the popular festival that takes place at Ferguson Station. Each week will also feature one food truck to Ferguson Station as part of the fest so tune in to twitter @HamIntlVillage to see who is serving at Music in the Village and when. For more information about ‘Music in the Village’ contact Susie Braithwaite at the International Village BIA at info@hamiltoninternationalvillage.ca and check out www.hamiltoninternationalvillage.ca.